Click here to download the pdf version of the image above. 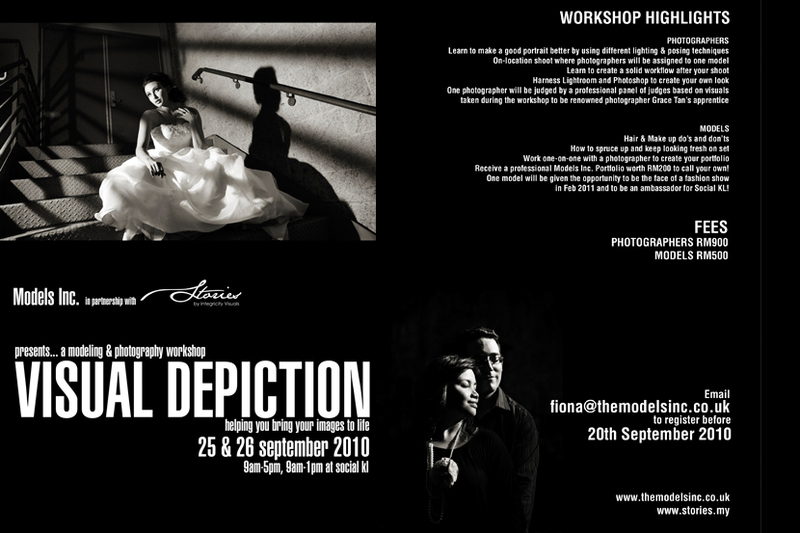 Organized by Models Inc., this exclusive workshop gives you the opportunity to work with models one on one. If you are looking to expand your portfolio, experience, learn how to ’see’ the light, and network with other photographers, PLUS get an opportunity to go on live shoots after the training, this event is for you! If you are an aspiring model, this is also an event for you! I am excited to share my experiences with all of you during this workshop. Day 1, learn how to make a good portrait even better by learning different lighting & posing techniques. You will be utilizing different lighting techniques from available light to off camera flash and also video light to create your portraits. From theory, we will move on to a practical on-location shoot as the photographers will have the opportunity to photograph the different models. Each photographer will be assigned to one model so you have maximum control, and the ability to build your own personal portfolio! For models, an up and coming stylist will coach you on hair and make-up application and will be giving tips on how to spruce up and keep looking fresh even on a hot day out on set. Day 2, learn about how to create a good workflow after your shoot. You will be learning some cool post processing skills using Lightroom and Photoshop. A panel of renowned photographers will be invited to review the images so that you can maximize your learning experience. After the review, one photographer will be chosen to go through an apprenticeship period with myself (T&C apply) – to learn from live shoots! Models will be given a professional portfolio worth RM 200 within two weeks of the end of the workshop, including a fashion show line up in October. Limited to only 10 photographers and 10 models – you are guaranteed a personalized experience. If you wish to sign up, please email fiona@themodelsinc.co.uk with the following subject and body. Body : Full name, contact number, alternate contact number (if any), e-mail address, IC number/ passport number, photographer/model. Previous postWindows 7 and loving it!